Town defender James Justin is left baffled that centre half Sonny Bradley is yet to get off the mark for the Hatters. The 27-year-old hasn’t found the net since February 17, 2018 while at Plymouth, where he scored 11 goals over two seasons at Home Park. 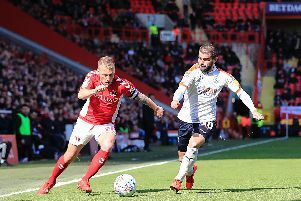 Justin can't quite believe that is the case, with Bradley often first to most corners that the Hatters send into the opposition penalty area, saying: “I don’t know what we have to do to get him to score, because it just seems like everything is not falling his way. “He was prolific at Plymouth, but hopefully we’ll just add him a few goals in the next few weeks. “He’s 6ft 5, doesn’t lose a header, so it’s pretty easy to pick him out. Justin has been on set-piece duty since club captain Alan Sheehan's spell on the bench and when asked about the added onus on him now, he added: “It’s a good responsibility. "It’s a lot of pressure on you when I first started, but I feel like I’ve moulded into it quite well. "We'd like to score more, but we’ve got a good understanding of what set-piece we do at what time and the organisation behind it.